Buy Xbox Live Card USD 25 for Xbox LIVE on GGlitch.com | Fast, secure and easy! 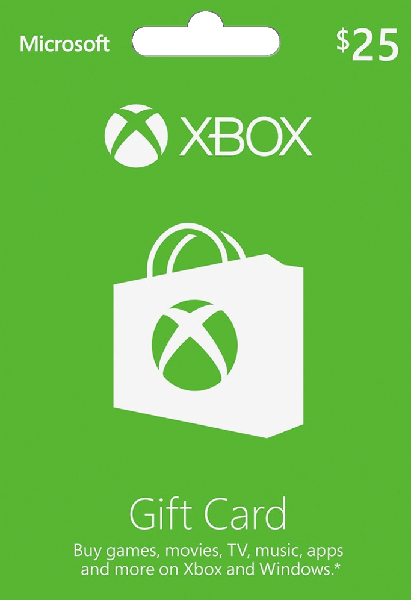 Get an Xbox gift card for games and entertainment on Xbox or Windows. Buy the latest games, map packs, music, movies, TV shows, and more. Great gift for a gamer Get games and entertainment for Xbox One, Xbox 360, or Windows. Buy the latest games, map packs, music, movies, TV shows, and more. * And on Xbox One, you can buy and download full blockbuster games the day they’re available everywhere. Great as a gift, allowance, or credit card alternative. Simply redeem the code to buy apps, games, or entertainment. Great gaming Download arcade and full Xbox games, or keep your games fresh with new map packs, songs, and workouts.